Consider the standard "input-process-output" model which basically illustrates the relationship of how a set procedure operates over its passed inputs to create an output. Regardless of how well-designed, ingenious, or infallible the process is, poor inputs will almost always have the potential to negatively impact outputs, hence the saying "Garbage in, garbage out". This is especially evident in hockey, where a player’s ability acts as the “process” in this metaphor and the context in which he plays effects the results he is able to produce. If you stack the deck against a player, it’s more likely that they’ll have a tough time successfully implementing their talent and skills to produce a favorable outcome. To help us quantify the degree of difficulty to assign to a player’s playing time, I had published a piece adjusting a player's xGF% metric considering his Zone Start Rate, Quality of Competition, and Quality of Teammates. To summarize, a player who produces equal results under harder circumstances deserves a bit of a boost in how we compare them to a player who performed equally under easier circumstances. That article quantifies exactly how much of a boost players should receive and this article discusses the results of those adjustments for the Devils defensemen. I encourage you to read the article explaining my methodology to better understand the results in which this article is based upon. However, with this analysis performed, let’s take a look at precisely who on the Devils blueline performs the best given the difficulty of their assignments. Please note, this data was pulled on January 2nd to provide a first half population to later test against the second half population at the end of the season. 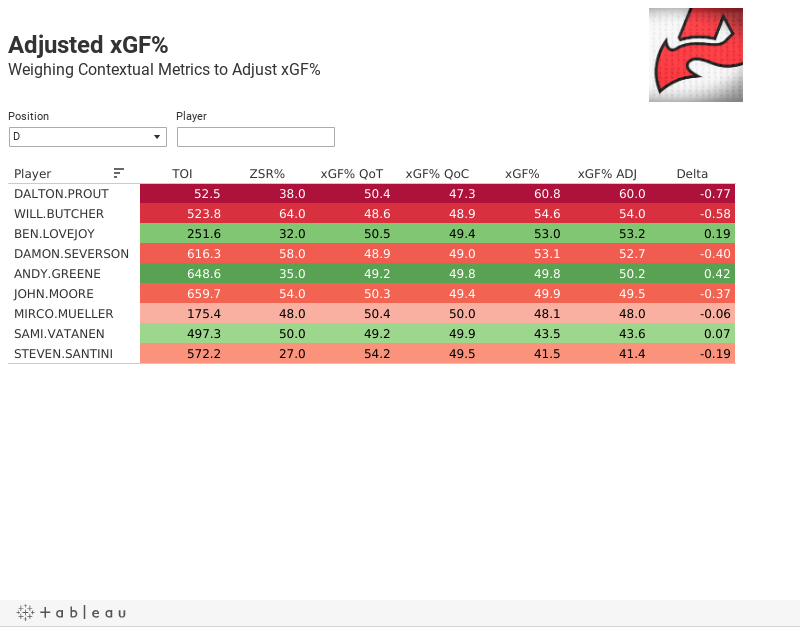 The following dashboard is filtered from best adjusted xGF% to worst, and colored by the amount and direction of their adjustment (Green color shows positive adjustment while red shows a negative adjustment). There is no doubt that Andy Greene has consistently the toughest job on the blueline. Only 35% of his zone starts are in the offensive zone and he plays with below-average teammates and against above average competition. Despite these factors, his 5v5 xGF% at the time of this pull (Jan 2nd, after game 39) was slightly under 50% at 49.8%. He receives a generous adjustment of +.42, which is by far the most on the team. Given this adjustment, we can assume that if he were playing with average quality teammates, against average quality competition, and with an average rate of offensive zone starts, he’d be playing at 50.2% xGF%. Is he setting the world on fire? No, not by any measure, but against top competition, in a defensive role, and shackled to a struggling Santini, Greene just about breaks even. He may not tilt the ice in favor of the Devils but the fact that he is able to neutralize the efforts of the opposition given his hefty handicaps signifies the successful completion of his role on the team as a defensive defensman. His counterpart, however, does not fare as well. Steve Santini did not receive any positive adjustment unlike his D partner Greene. His xGF% was adjusted by -.19 to be the worst on the team. The difference between he and Greene is that despite Santini having only 27% offensive zone deployment (lowest in the sample taken), he plays with a much higher quality of teammate than Greene and against slightly easier quality of competition. His pre-adjustment xGF% is a poor 41.5% and his adjusted xGF% falls to a worse 41.4%. Ouch. I think Santini still has potential to come up and become a perfectly serviceable NHL defenseman, but boy did he get a brick-boot swimming lesson this season. Damon Severson does well for himself before and after adjustment. His 53.1% xGF% gets adjusted down to 52.7% given his higher than average Quality of Teammate, lower than average Quality of Competition and favorable zone start rate. Nonetheless, Severson is having a great season. Sami Vatanen does not show well in this analysis. At the time of this pull, Vatanen had a xGF% of 43.5%. After adjustment, Vatanen sees a marginal improvement to 43.6%. When I rerun this analysis at the end of the season as part of a validity check, I would expect to see a higher xGF% for the Finnish blueliner. Will Butcher has the highest xGF% after adjustment (54.0%) of all regular roster defenseman (Sorry Prout, I'm leaving you out), despite his adjustment of -0.58% due to his high offensive deployment, lower quality of competition, and higher quality of teammate. Does this mean Butcher is the best defenseman on the team? Considering that this adjustment only accounts for 3 of the countless factors that impact a hockey game, probably not. All I can say with any confidence is that Butcher looks good in his sheltered role by this analysis. Ben Lovejoy is having an underappreciated season paired with Butcher. His adjusted xGF% is second only to his D partner at an adjusted 53.2%. Lovejoy actually gets a boost from the adjustment as his Zone Start Rate is well below average and his quality of teammate/competition are just about average. Have a look at the dashboard above and see what you can learn about the environments in which your favorite Devils play. Feel free to change the filter in the top left to include Forwards as well. If you like it, share it and if you disagree, let me know why on Twitter @Devils_Data.